While it can be tempting to push the limits of what your vehicle can do without maintenance, skipping your scheduled oil change in Aiken SC can mean more costly car repair services in your future. You may not think about the state of your car’s oil—but ‘riding dirty’ can be detrimental to the health of your engine. All car owners know changing the oil every 3,000 miles is a basic rule of car maintenance. Not many know exactly why this holds such importance. To understand what happens when you don’t follow your mechanic’s advice about changing your car’s oil regularly, it pays to know what oil does to your vehicle. The oil in your engine is crucial to keeping your car or truck running as smoothly as possible. Its main job is to lubricate your engine while cooling its components by carrying heat away from the engine. When your engine is fired up, it circulates oil in order to lubricate all internal components and prevent them from malfunctioning. As the oil moves through each part of the engine, it also works to draw heat that the mechanism produces to help keep your engine from overheating. Regular Oil change in Aiken SC is crucial, because as engine oil moves through your motor, it also picks up debris and dirt from different engine components. Over time, your oil may get too muddy to be effective in lubricating parts and cooling your engine. This is exactly why it is crucial to have your oil changed regularly. The question remains: What happens when you fail to get your oil changed as part of your regular maintenance? The simple answer is that your car will start to have all kinds of issues that can be costly to repair. Perhaps the most common problem faced by car owners who skip oil changes is frequent overheating. Not only can this cause your engine to lose efficiency, it can also cause some components to wear out and warp. Additionally, the lack of lubrication will cause even greater wear, resulting in the need for more complex car repairs. Wayne’s Automotive and Towing Center is a great place for car repair services and oil change in Aiken SC. Don’t wait for your car to breakdown before deciding to get an oil change. Maintenance is a lot cheaper than having to replace your engine or paying for more costly repairs. The transmission is one of the most critical parts of a working car. If it loses function, you basically lose the entire vehicle’s functionality. The transmission serves as a powertrain, which converts the force of the engine into a controlled power source. If this powertrain malfunctions, finding the cause of the issue can be difficult because auto transmissions consist of many moving parts, making auto transmission repair quite a complex undertaking. 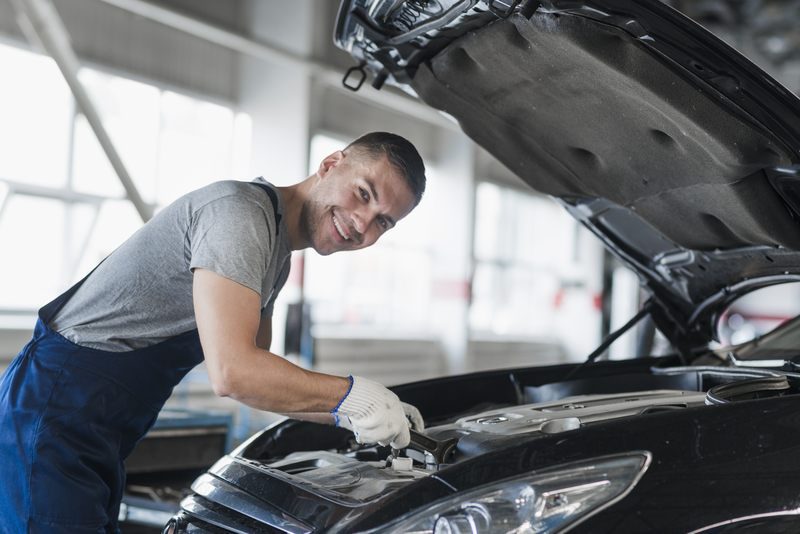 Fortunately, you can always turn to professional auto repair centers like Wayne’s Automotive Center for thorough assessments of your auto transmission repair and diesel engine repair needs. Wayne’s Automotive Center specializes in full-service repairs and car maintenance procedures, helping you keep your vehicle in optimal condition and free from issues that put your safety at risk and are costly to resolve. Bell housing – An auto transmission bell housing refers to the cone-shaped metal case located underneath the vehicle for rear-wheel drive cars. In front-wheel-drive cars, it is located under the hood, besides the engine. Unless you’ve been involved in a major accident, your transmission bell housing rarely needs repair because it mainly functions as a protective case for the transmission mechanisms. Gears – Automatic transmissions automatically change gears for you. However, gears still need changing when worn or damaged. Transmission gears are many and varied, but they can be broken down into plenary gears and major gears. All of these gears need to be in good condition in order for your car to move. When damaged or significantly worn, they can cause issues that may necessitate auto transmission repair or rebuilding. Transmission fluid – Another critical part of the transmission system is the transmission fluid, which needs to be kept at adequate levels to avoid various system problems. Transmission fluid leaks are among the most common problems that require immediate repair. Filter –The transmission fluid needs to be kept clean to prevent wear and tear on the system’s moving parts. Changing the filter periodically helps keep contaminants from polluting the transmission fluid. How to Choose Your Car Battery? Replacing the battery will be necessary at least once or twice in the lifespan of your vehicle. Waiting until your car requires car battery replacement service or can no longer function properly, isn’t the best time to start shopping for a replacement. Car batteries don’t wear out easily. In fact, they have quite long life cycles. This doesn’t mean that they are immune to normal wear and tear, especially with repeated charging/discharging cycles and regular aging. The best approach to car battery maintenance is to visit your automotive service shop on a regular basis for a proper overall check-up of your car’s systems. Professionals will inspect your engine and prescribe the correct routine maintenance that your vehicle needs to ensure optimum performance. Preventing a dead battery will save you a lot of stress. Wayne’s Automotive Center is always available to give you the assessment that your vehicle needs to ensure proper car maintenance, including car battery replacement service. Car batteries serve as compact electrical storage units for your vehicle. They convert chemical energy to usable electrical energy to supply the electrical needs of your car. Car battery technology hasn’t changed much in the last 70 years. These crucial car components have a lead-acid design, wherein electrolyte or acid reacts with interior lead plates in order to produce electricity. Naturally, it takes more energy to power a bigger engine than a smaller one, so the first thing you should remember when going to an automotive service shop for possible battery replacement is to look for car batteries that are rated and sized accordingly. Newer car models have more electrical demands than older ones. This is due to the addition of computers, accessories, and modules that require more power to operate. This is another important factor to consider when looking for a car battery replacement service. In addition to a properly sized and rated car battery, you want a unit that is powerful enough to supply the electrical load that additional systems require in order to work properly. When a battery is too small, you risk overworking its mechanisms to meet the power demands of the vehicle, causing the battery to fail prematurely. This will also mean more frequent replacements. Speak with automotive service shop professionals who know the exact requirements of your vehicle to make sure you are choosing the right battery.